Central and Eastern Macedonia, Greece. 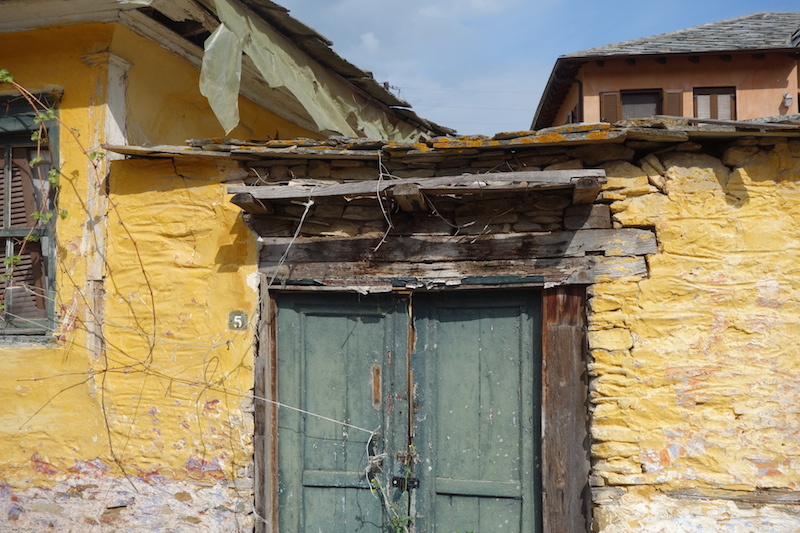 The previous post left us pondering the Holy Mount Athos republics. Along the coast towards Kavala. Had it been later in the day we might have set up camp down there. 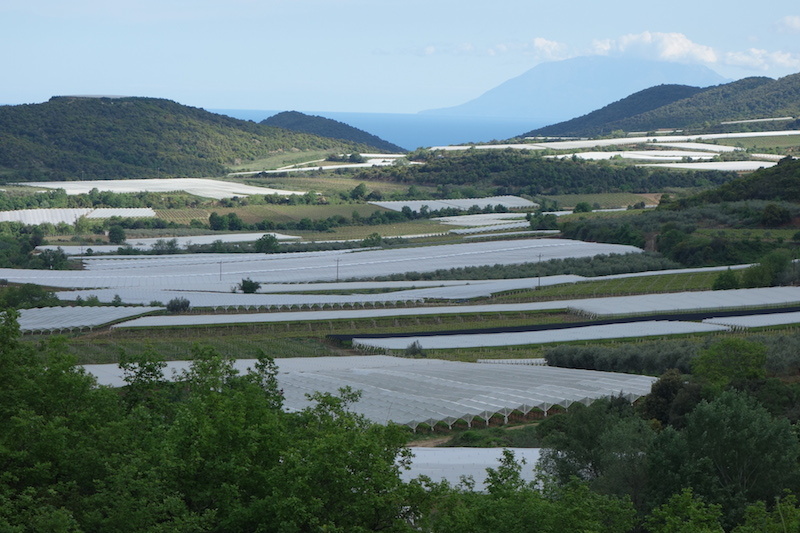 The traffic in Kavala was horrendous so we immediately did a u-turn and headed for the bush, finding ourselves in a grape-growing area not far from the coast. 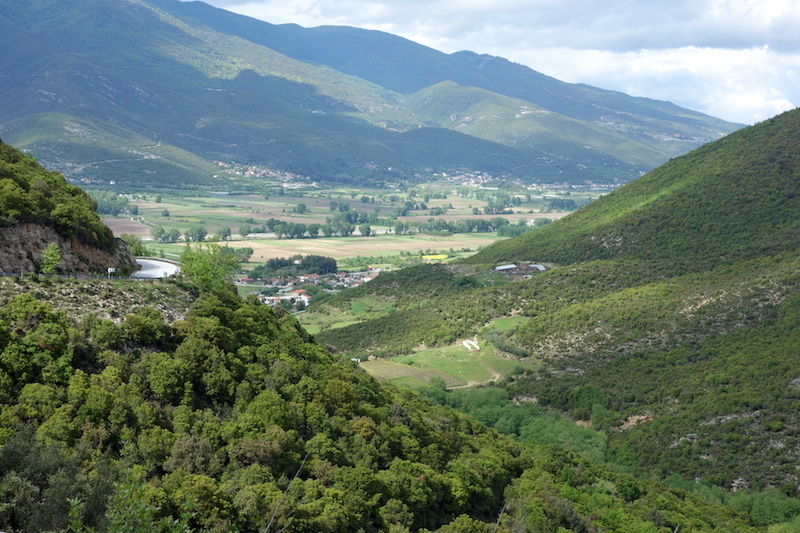 The countryside was mountainous and ruggedly beautiful. The region had received substantial rain during the past week and together with previous rains the month turned out to the wettest in one hundred years. This made getting off the sealed roads a little hazardous. 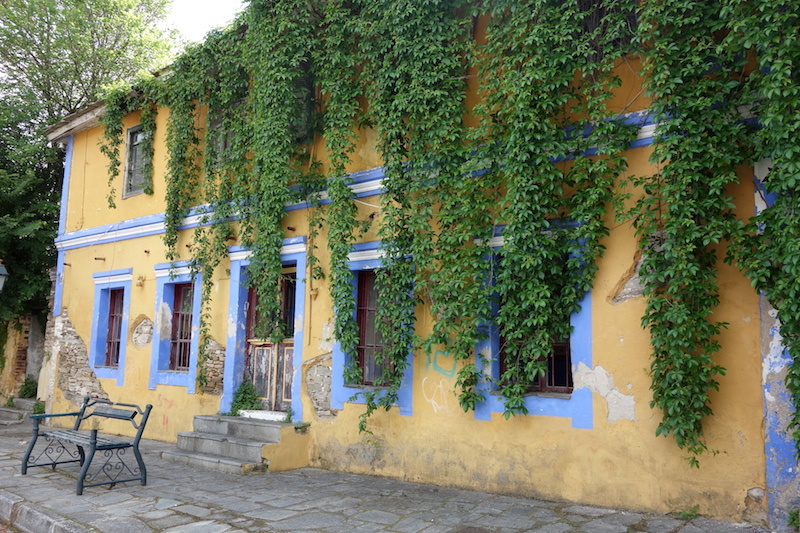 After driving around in what seemed circles and passing from one fertile and verdant valley to another, we found ourselves at a hillside hostel overlooking to town of Eleftheropolis ( Elef-ther-o-polis). The hostel was closed which was bad luck so we decided to go back down the hill a little and stealth camp on the edge of an old slate quarry. It wasn’t the best of locations as we felt exposed and as well it seemed to be a local lover spot. I camouflaged the car as best I could with some shrubs and because we have never been bothered before thought it should be a safe enough camp. As we were about to pitch our tent a car went up the hill so thinking the hostel owners were going to open up we followed them. The occupants of the car were from a local TV channel and were filming sunset images over the town below. While chatting to them it began to rain and the recommendation of a hotel in the town seemed like a better option than camping. Hostel on the hill. Unfortunately now closed permanently, a victim of austerity measures. The town of Eleftheropolis was not Greek-like at all. Its backstreet architecture was more like what would be found in the mountains of southern France. In the 1800 and early 1900s commerce in the town revolved around the manufacture of cigarettes. The factories now lie idle and abandoned. If they were in a more affluent location they would have long been converted into trendy apartments. 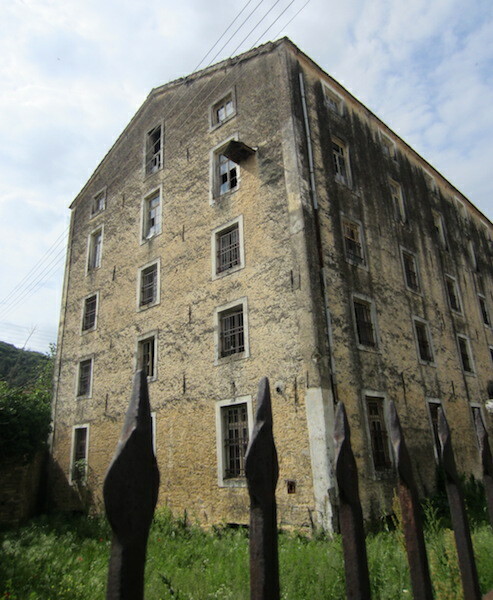 Old factory waiting for the developer. 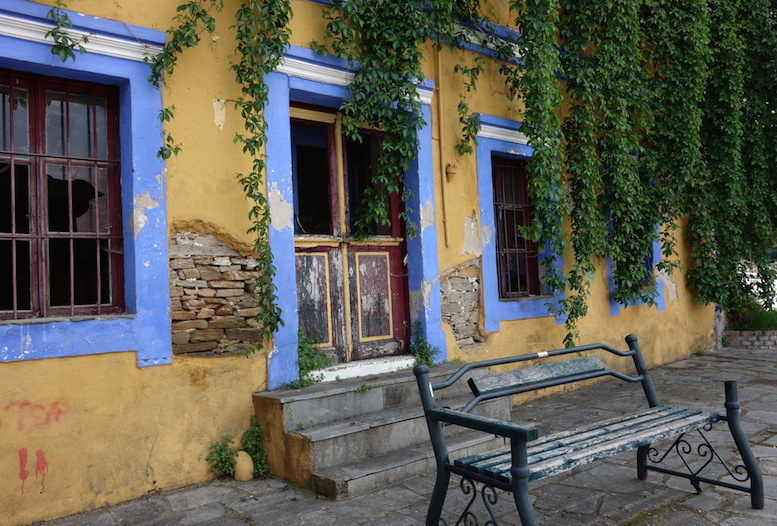 Following is a photographic essay of the old town Eleftheropolis. The dictionary definition of a photo-essay is a set or series of photographs that are intended to tell a story or evoke emotions in the viewer. The following series of photographs certainly do arouse emotion in me. I see time in decay and as a result one day in the not too distant future these buildings will no longer be standing for the back lane traveller to see. The doors, the windows, the walls, in fact every stone, are what I call condensers of memory. What a location for a fashion shoot! Bottom panels of the front door. Through the panelled door to a ticket seller’s box. The building must have been used as a theatre at one stage. No 5 and lintel on lintel. 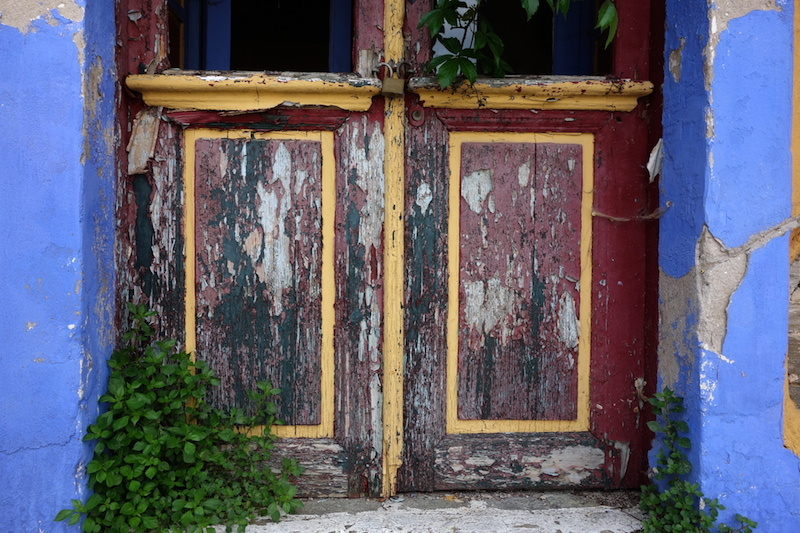 A door with stories to tell. Put this configuration in an art gallery and people would view it with awe. There is a world art gallery out there waiting to be visited and it’s free. An occupied house. I expect the roof might have leaked. 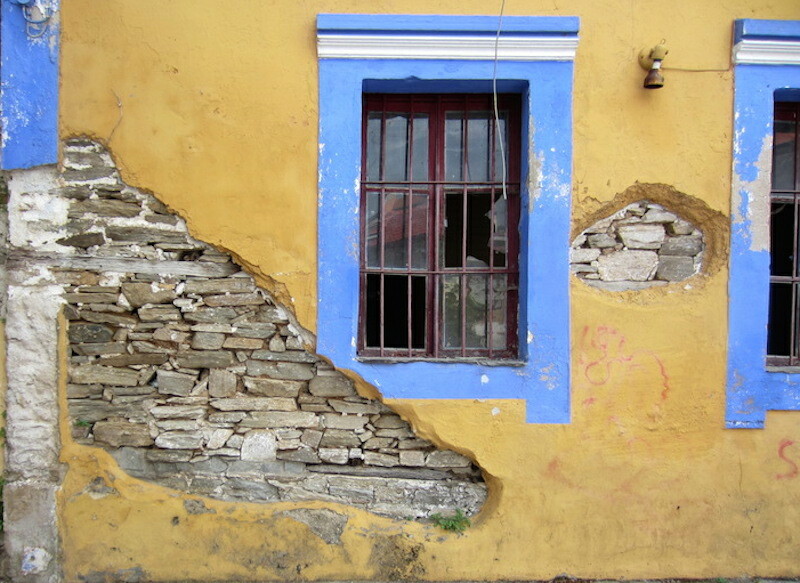 It is a common practice when stucco on the outside of a wall is being repaired to leave a section so passers-by can see how the wall was originally constructed. The above photograph is a fine example. The stucco here was about 100mm thick. Lath and plaster walls are usually reserved for internal wall construction but in the case above it was used externally and I suspect for financial reasons. Narrow strips of wood or split boards were nailed horizontally across the studs. Laths here were about 45mm wide by 5mm thick. Each horizontal course of lath is spaced about 10mm apart. Plaster in the form of a coarse sand and lime was then applied. The applier drags the board upward over the wall, forcing the plaster into the gaps between the lath and leaving a layer over the laths. Curls of plaster (keys) between the lath gaps stop the plaster from falling off. Traditional lime-based mortar often incorporated horsehair, which reinforced the plasterwork, thereby helping to prevent the keys from breaking away. 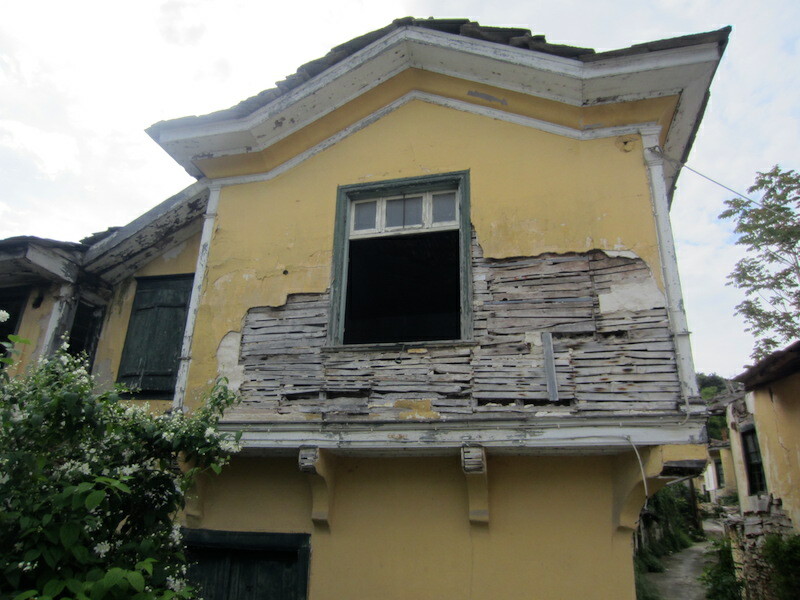 Double storey lath and plaster house. 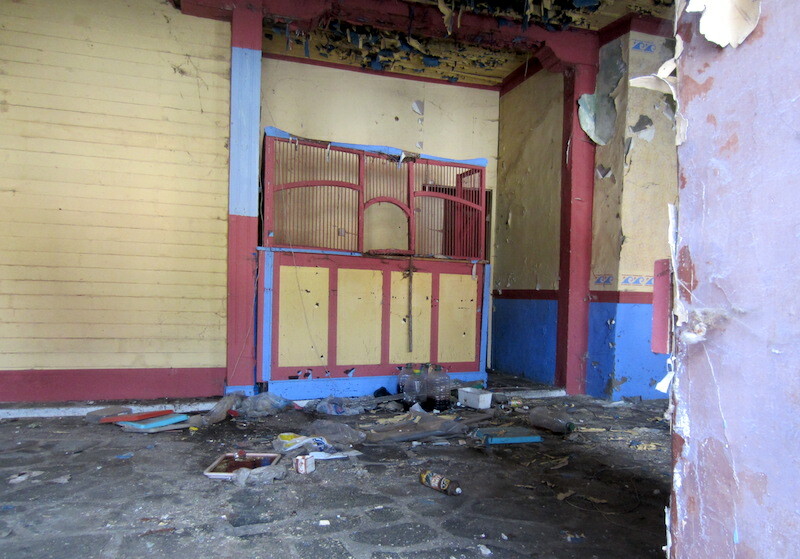 A wall collapse has allowed us to look inside. 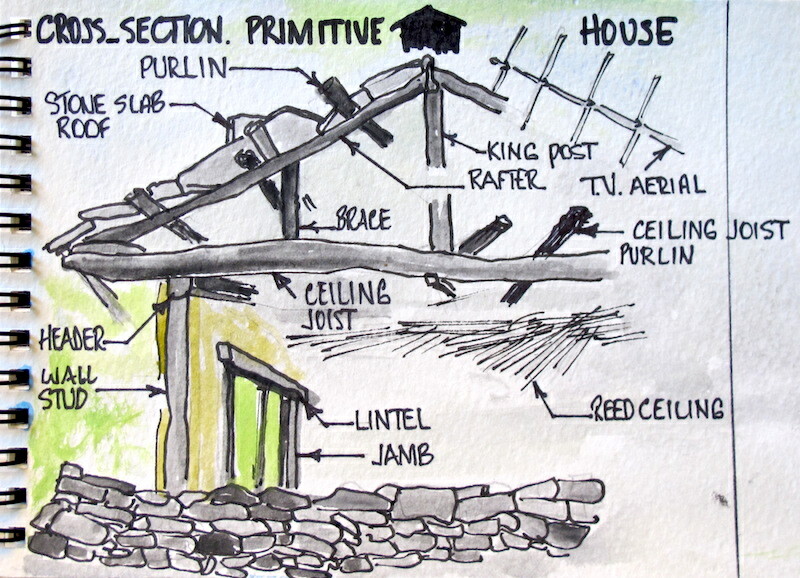 A drawing to help in appreciating the work that went into the house in the previous photograph. 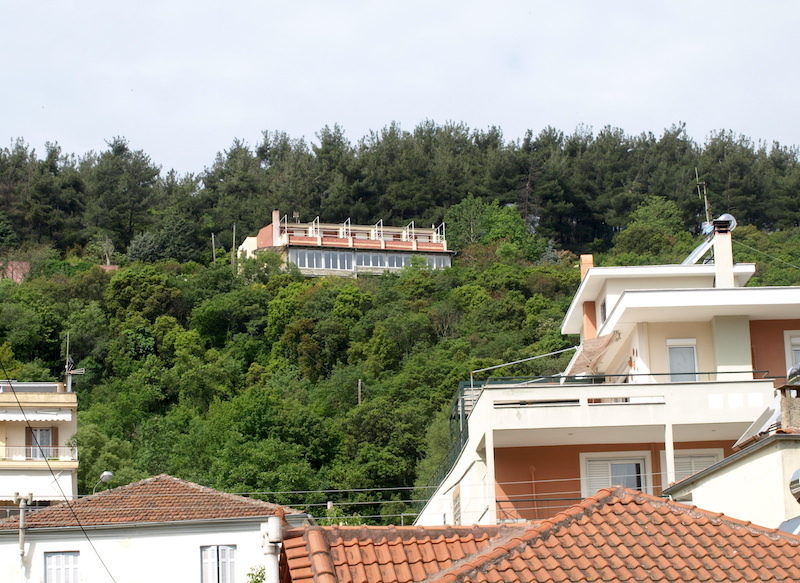 Not all of Eleftheropolis is old world, there are some very modern houses and buildings. 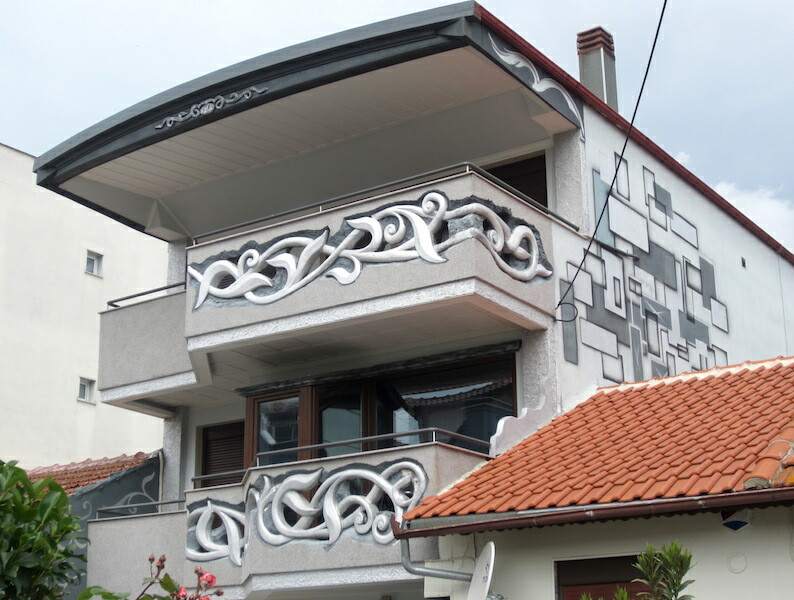 The construction of this very modern apartment was a test of skills for the plasterer. I bet it was subject to some behind the hand whispering when it was being built as it is nothing like the old traditional buildings of the region. 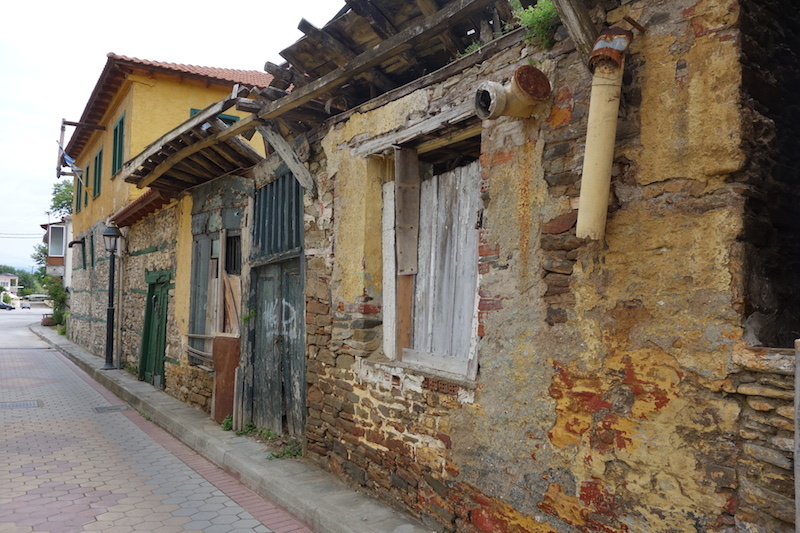 From Eleftheropolis we headed north in the direction of Bulgaria and our first stop was the town of Drama. 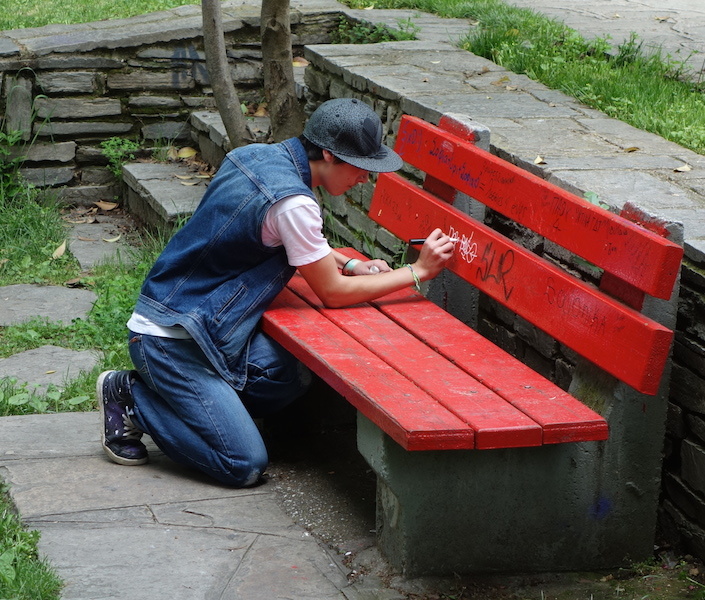 In the park I caught a graffiti vandal red-handed, defacing a park seat. Without hesitation I verbally abused the tagger. He took no notice and casually walked off. Sadly, his parents and a girl were nearby. Was he trying to impress the girlfriend? Removing the tag with a handful of grass. 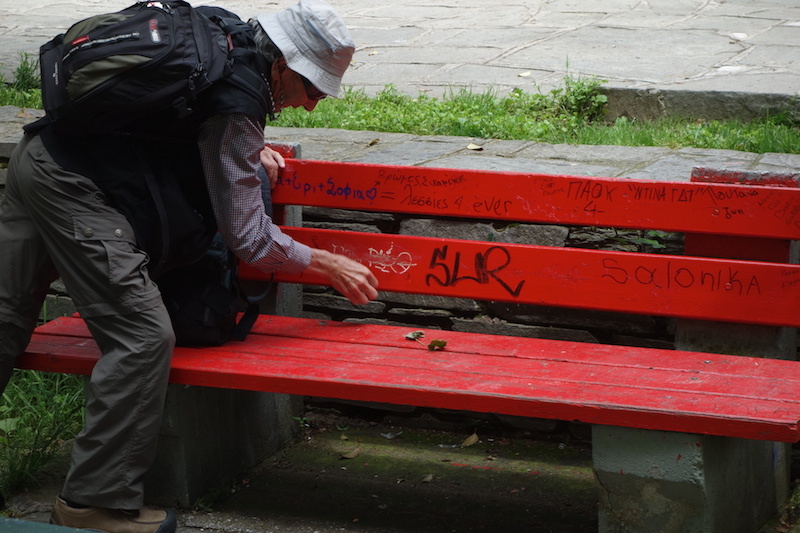 The following photograph shows why I have a set against some graffiti. 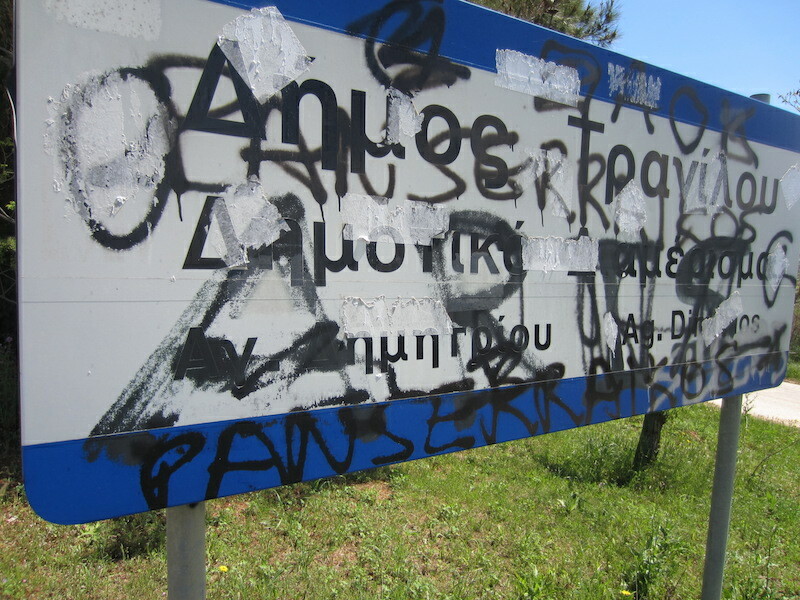 It’s difficult enough navigating around Greece when you can’t read the writing. It’s impossible when the sign is covered with graffiti like this. Ignoring the graffiti, Drama central park is a pleasant zone with a natural watercourse as its main theme. There are gigantic plane trees and some simple telling monuments. 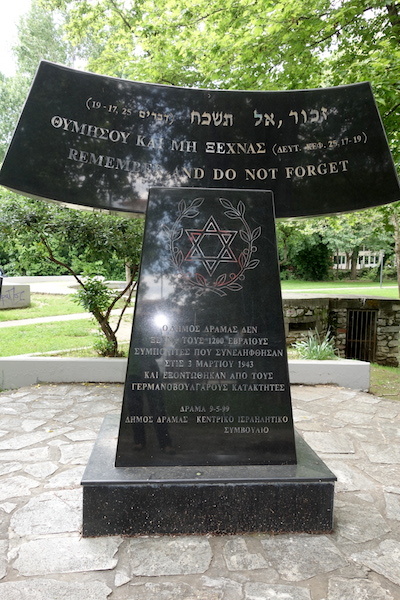 A polished black granite monument dedicated to lost Jewish lives during WW2. 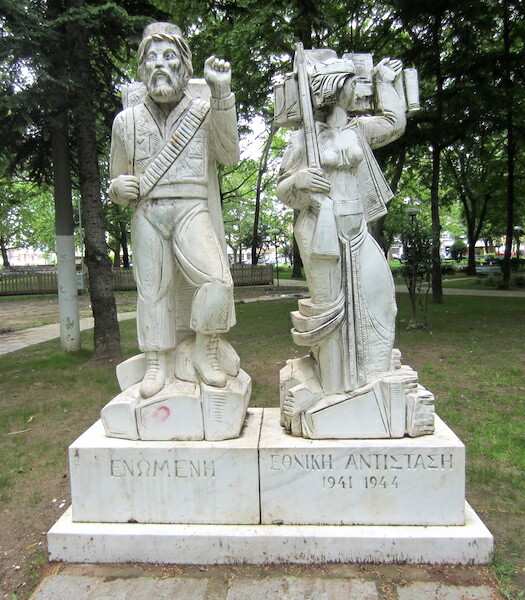 There were many atrocities committed against Greek people at the hands of the Bulgarians and Germans during WW2. Between 11 000 and 12 000 Jewish people of the region were sent to labour camps, never to return. The inscriptions stated the number of people taken from surrounding villages during WW2. Graffiti scoundrels have defaced the memorial. Memorial to the resistance fighters WW2. 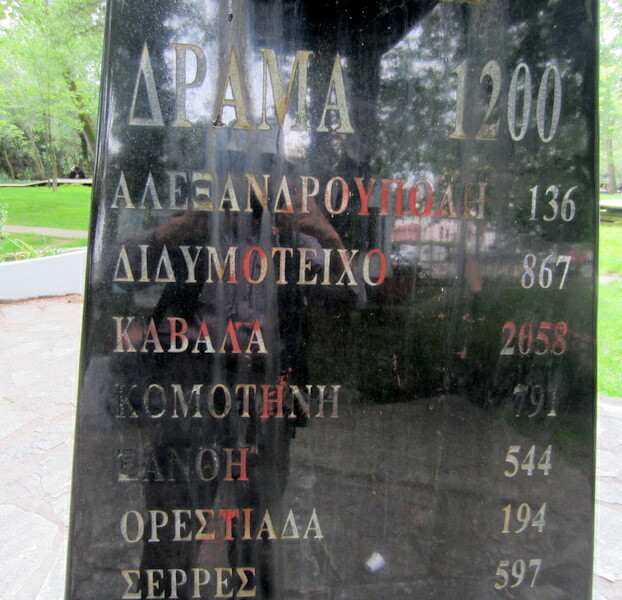 And another memorial to those who suffered under the hands of the Junta. The Junta came into being in the late 1960s and was led by Colonel George Papadopoulos. Papadopoulos declared that it was necessary to take control of Greece to stop the communist threat. Martial law was imposed, strikes outlawed, long hair (on men), mini-skirts, the peace symbol, Beatles music, the writings of Mark Twain, free press and the letter Z were all banned. The letter Z was considered to be a graffiti tag and represented non compliance to order and as well a French film made at the time called Z told the story of a rather dull, right-wing military-dominated government’s attempts to combat leftism. 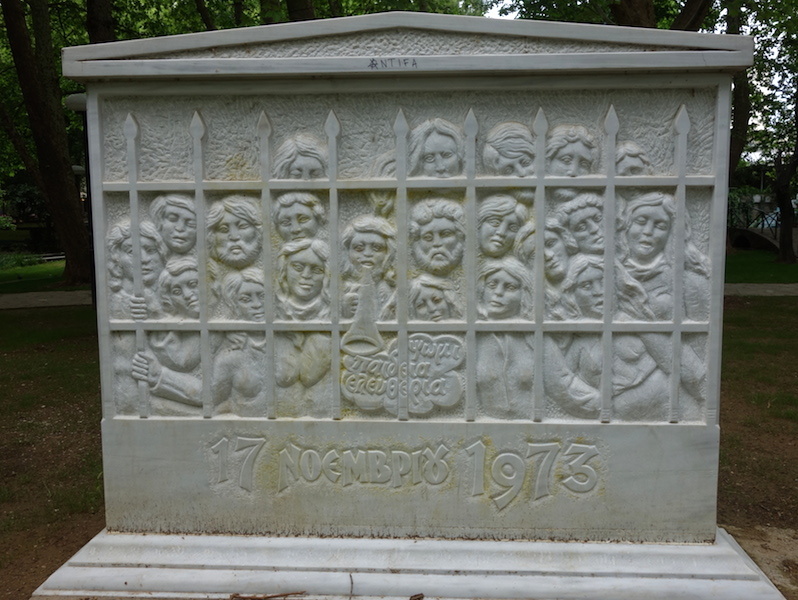 Thousands of communists and those opposing the Papadopoulos regime were thrown into prison. Martial law, censorship, arrests, beatings, torture, and killings were all part of the cure the colonels had in mind for Greece. The Junta was still in power when Bev and I visited Greece in 1972/3. The stream running through the park in Drama. 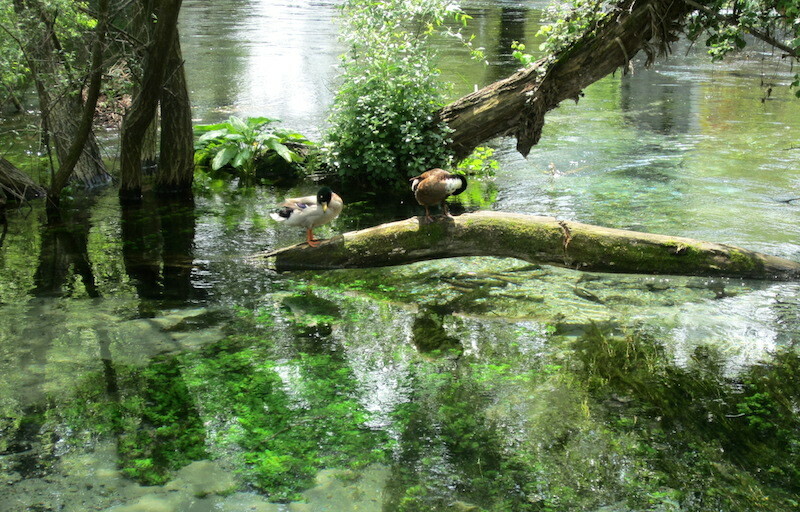 The reason for such clear water is that it flows from a subterranean spring in the nearby mountains. 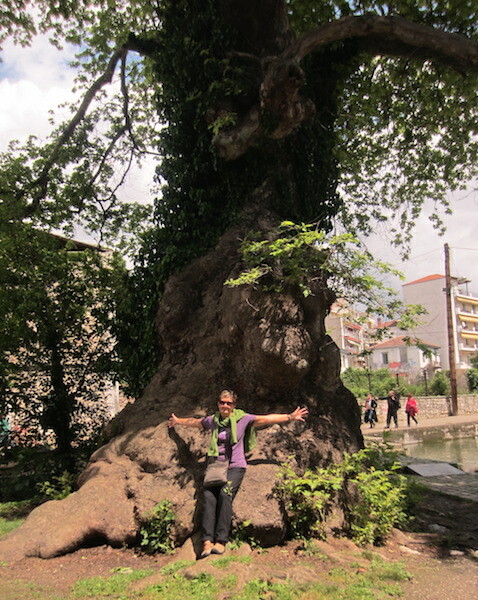 One of the gigantic plane trees in the park in Drama. There was no drama getting out of Drama. 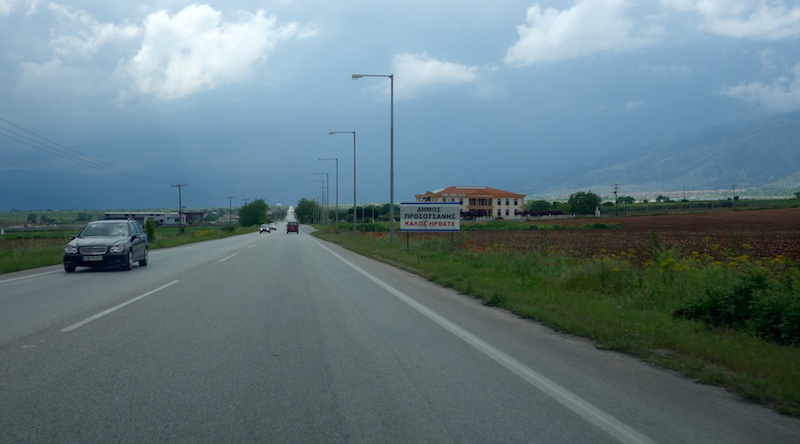 We headed north, crossed a mountain range and not far from the Bulgarian border turned west with the aim of staying in the area of Serres not far from Thessaloniki. The road to Bulgaria. Excellent cycling country, if it’s flat country you want. 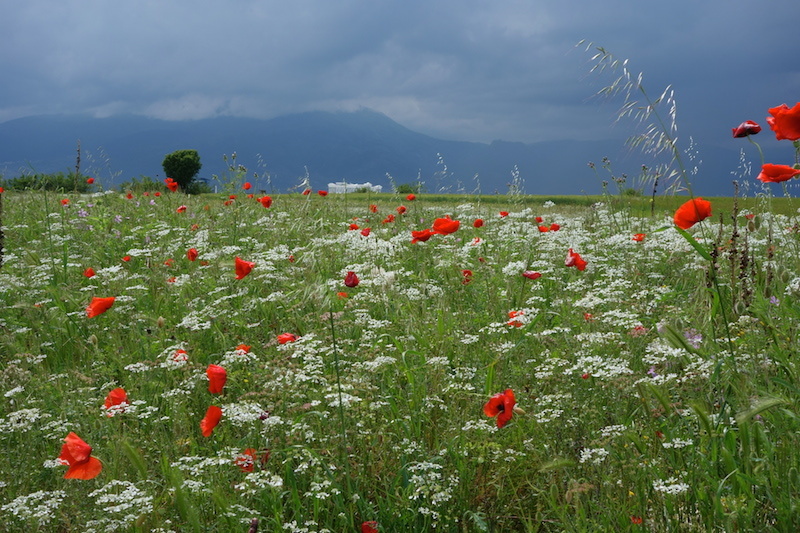 Red poppies and the mountains towards Bulgaria. Fields along the road to Bulgaria were covered with the poppy I know as Flanders Poppy. The name Flanders is particularly associated with battles that took place along the Western Front during WW1. 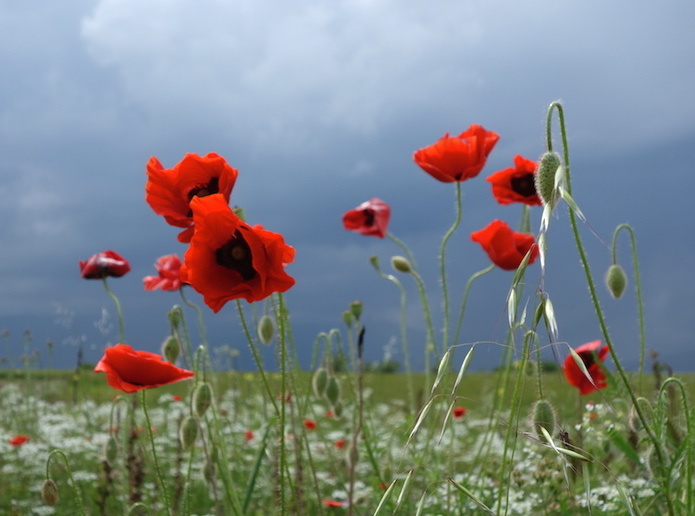 Naturally on war fronts the ground becomes disturbed and it’s disturbed degraded land in which the poppy thrives. The poem, ’In Flanders Fields’ by Captain John McCrae, brought the poppy to prominence. The poppy is also known as the corn rose, field poppy, red weed, coquelicot and, due to its odour which is said to cause headache, the headwark*. It is considered an agricultural weed and is now the symbol of a fallen soldier. It is closely related to the Opium poppy. During the 20th century, the wearing of a poppy on or before Remembrance Day each year has become an established custom in the western world. In Australia and New Zealand it, along with rosemary, is worn on Anzac Day. 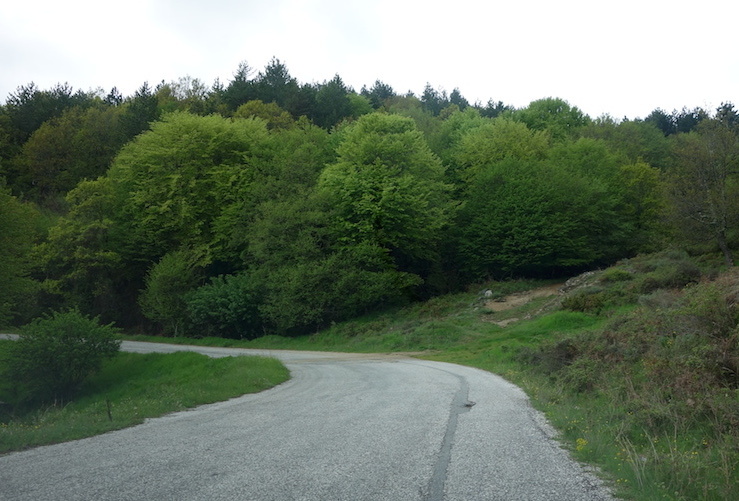 The road between Kato Nevrokopi (13 km from Bulgarian border) and Serres took us over a scenic mountain range from fertile lowlands to mountain forests, alpine passes and down to the rolling hills around Serres. Driving west not far from the border we came across reminders of 20th century conflict: tank traps. 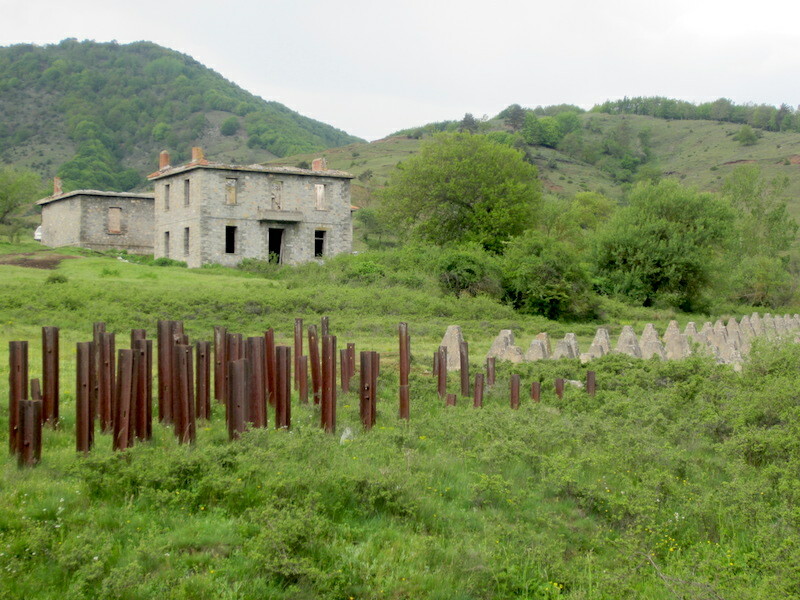 Tank traps near the Bulgarian/Greek border. Railway lines driven deep into the soil and the concrete trapezoidal pyramids stop tanks in their tracks, they cannot drive over such obstacles. 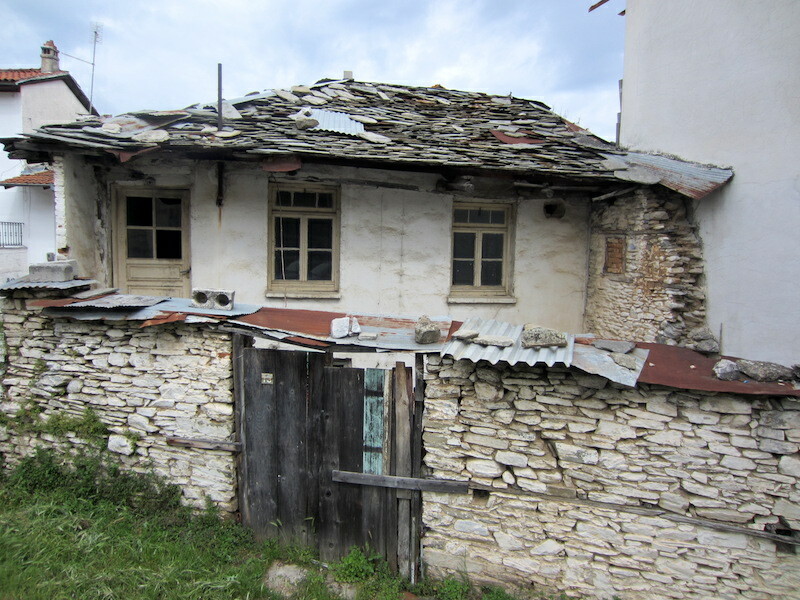 Bulgarian relations with Greece, a traditional enemy, are now stable. In 1986 the two countries signed a declaration of good-neighbourliness, friendship, and cooperation. 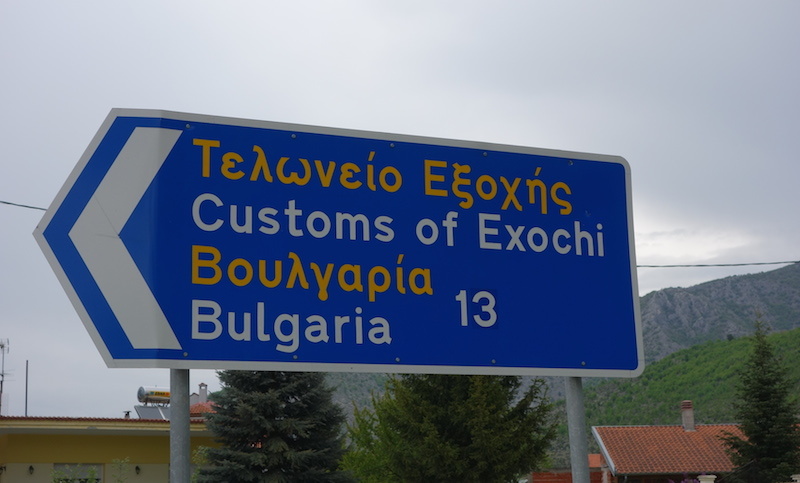 In early 1989, Bulgaria signed a ten-year bilateral economic agreement with Greece so, for the moment, it’s all quiet along the northern borders. 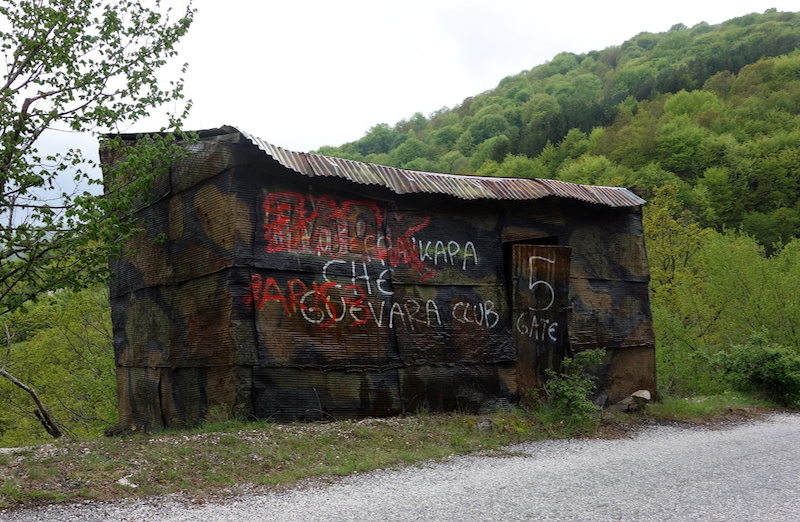 Flattened oil drum shed on the way to Serres. Using flattened oil drums as a cladding material was difficult. First the top and bottom of the drum was removed then the drum split longitudinally. The split drum was placed in a fire and heated to red heat, withdrawn and unfurled and flattened, extremely hot laborious work. 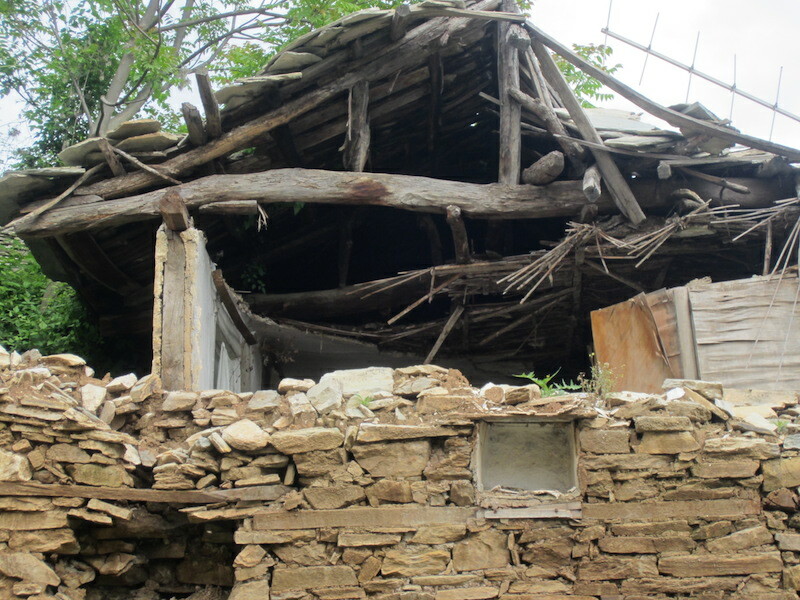 I suspect the shed in the photograph was built from drums in which bitumen was transported for sealing the mountain road. The name written in white paint is that of Argentinian Marxist Che Guevara. He was highly politicized and a controversial figure during the 1950/60s. He was an idealist, a man who took the side of the underdog and was willing to die for a cause. 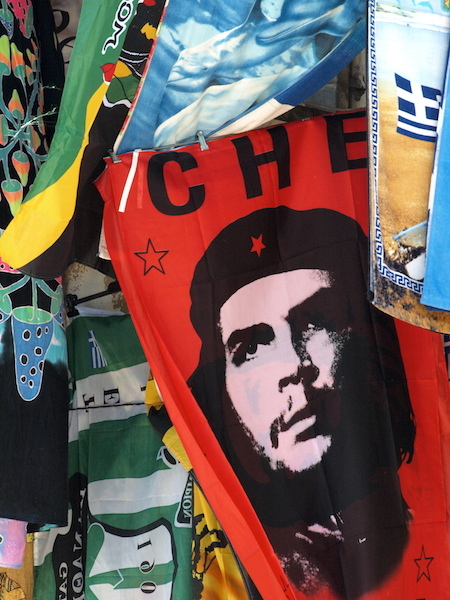 Che Guevara’s image is viewed as everything from an inspirational icon of revolution, to a retro and vintage logo. It is said Che’s image signifies ‘anything to anyone and everything to everyone’. Che Guevara (1928-1967). Photograph taken in an Athens flea market. 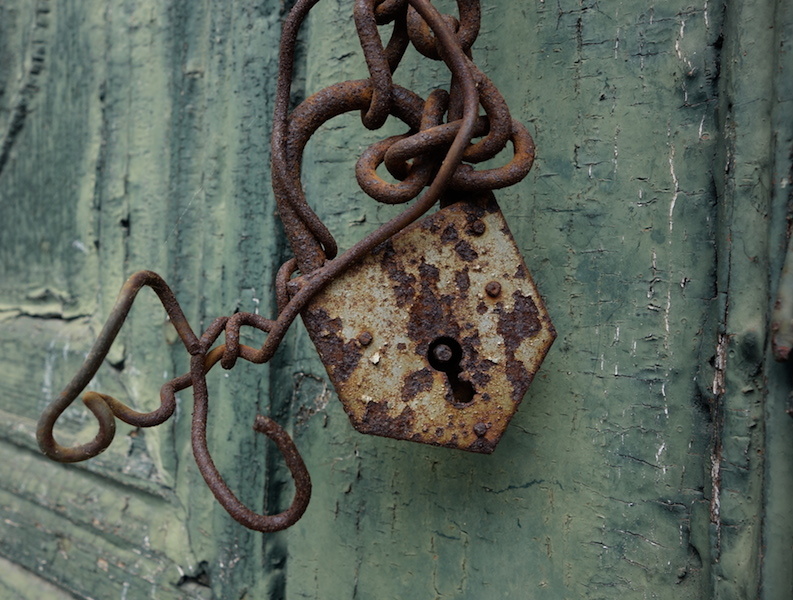 To successfully publish a diverse blog it is necessary to have one’s own private photo stock. We haven’t caught up with Getty Images stockpile yet but we must be getting close! During Encountering the Past Odyssey Part 1 we took and stored around 15 000 images. I was glad of the above image. At the time I didn’t know when I would use it but I knew I would. The road over the mountains. The backfilled trench is where optical fibre cables were buried. In places the trench has slumped, creating a deep trench that would be a hazard for cyclists! 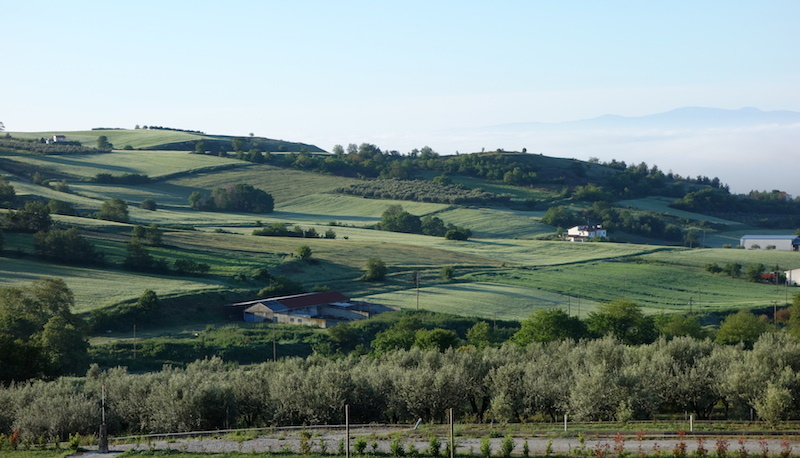 The countryside around Serres, reminiscent of England and Ireland. 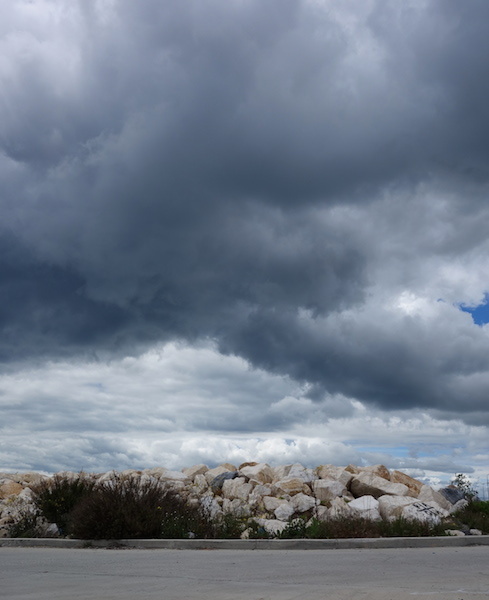 Took lodgings in a hotel in Serres as again bad weather was predicted. We must be getting soft, seeking shelter whenever bad weather is on the horizon. In our youthful travelling days there were no iPads to look up future weather outcomes, we would have pitched our tent and worn the weather. Bad weather on the horizon. Solar panels in the wheat fields near the hotel where we stayed. 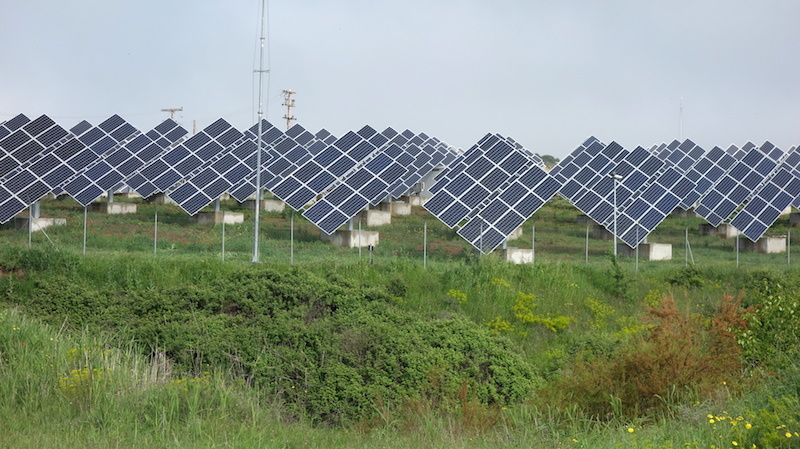 The Greeks are very much into solar power. Just about every village has a bank of panels on its outskirts. Why is it that in Australia, the land of everlasting sun, towns are not solar-powered? A probable answer: the coal industry may have too much influence over government alternative energy policy. I guess some may dispute this. 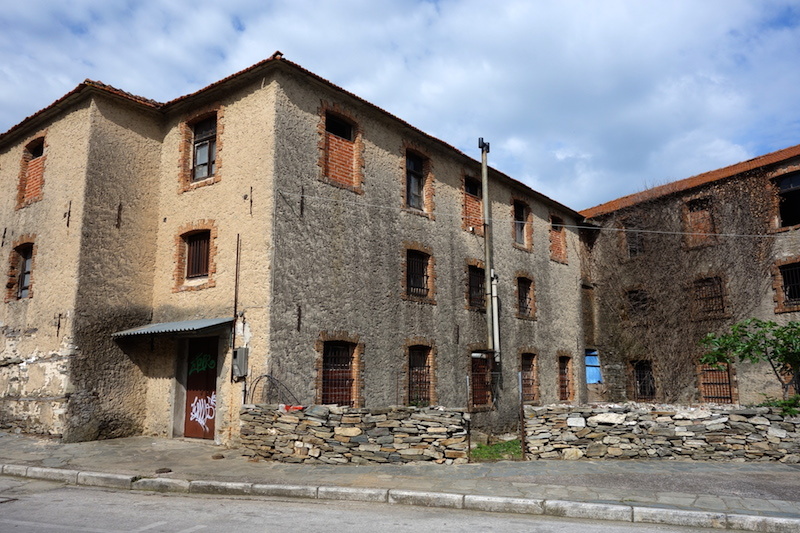 After Serres we pushed on back to Thessaloniki but on the way we discovered the small town of Nigrita. In the main street we met bike rider Chris who was sitting in the outdoor section of a café, not supping on coffee but eating from his own food stocks, the café owners didn’t seem to mind. Greek café owners are so tolerant and accommodating, it behoves us all to learn from them. Nigrita. Chris, a Californian lad riding from Holland to Istanbul with two weeks to complete the task (about 2500 km). It’s easy to ride the world staying in hotels each night (called credit card camping) but not so easy if sleeping rough. I asked Chris how he was coping with the unusually wet weather. He said OK. One night as he was preparing to sleep rough in a partly built house an old lady dragged a wire bed to him to sleep on. She didn’t want him sleeping on a cold wet concrete floor. I suspect she was grandmothering him. Following the meeting with Chris we had breakfast in a nearby café and there we met a Greek Chris who helped us out with menu translation. Thanks Chris. Back in Thessaloniki, turning in the car was an event. The owner, Vangelis (the gentleman we met at the Thessaloniki yacht club), Verenia the office receptionist and the head mechanic came to bid us farewell. There was much hugging and kissing. Only in Greece that would that happen, I can’t imagine any of the major car hire company staff being so emotional when a customer returned a car. That’s the end of this post, in fact the last from Greece. 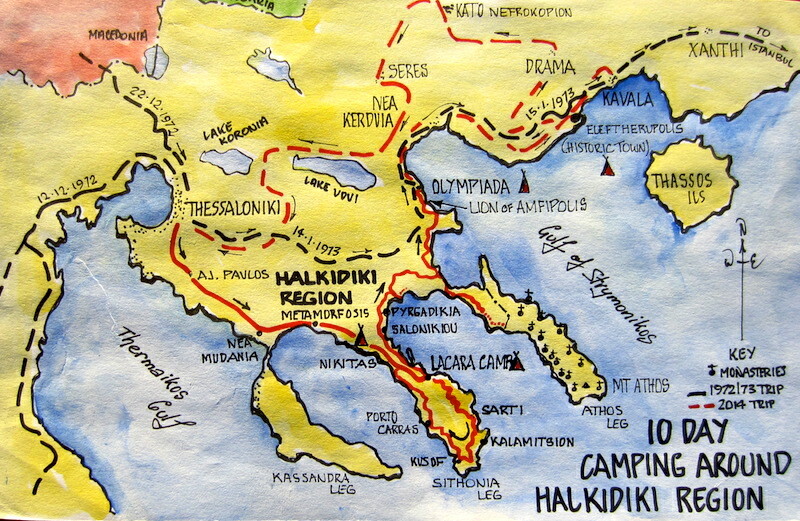 All in all, we spent seven weeks wandering around Greece and in that time we met some friendly and wonderful people, ate some pretty good tucker and saw some very remarkable landscapes. Interwoven with these attributes was its history, something all visitors to Greece should strive to understand. Understanding a country’s past gives us an insight into why things are the way they are. 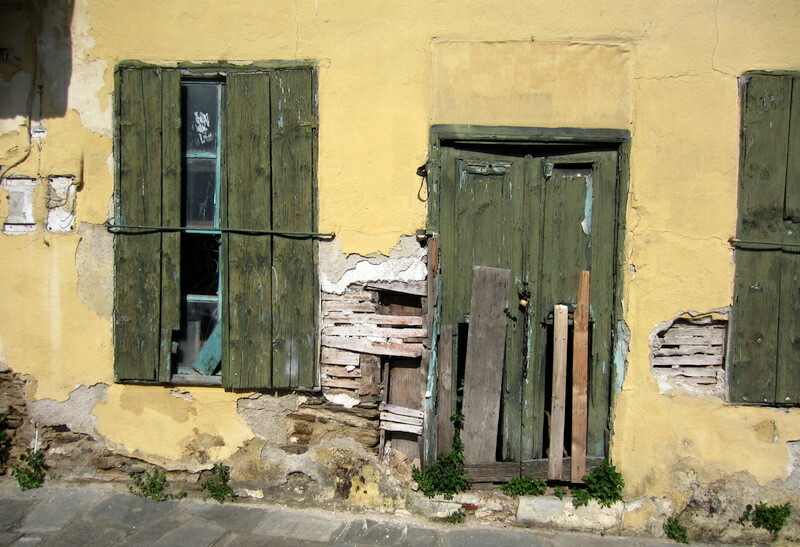 Many outsiders make derogative glib comments about Greece’s present difficulties. If they understood its history they may well realise that there are always two sides to a story. Statements like ‘the Greeks are lazy’ are unfounded. Many have two jobs in an attempt to meet crippling government taxes and many are unable to find employment because their positions, once considered secure, have been consigned to the trash bin. The Greek people, or at least the ones we met, work extremely long hours and get paid a pittance for their efforts. I’m not wanting to sound condescending but the ordinary Greek people need our help and the best way to help is to go there and spend money. If you do go, don’t go with expectations. It’s of no consequence really if the escalators do not work, traffic lights have stopped working or whether the roads are pot-holed. What’s important are the people. 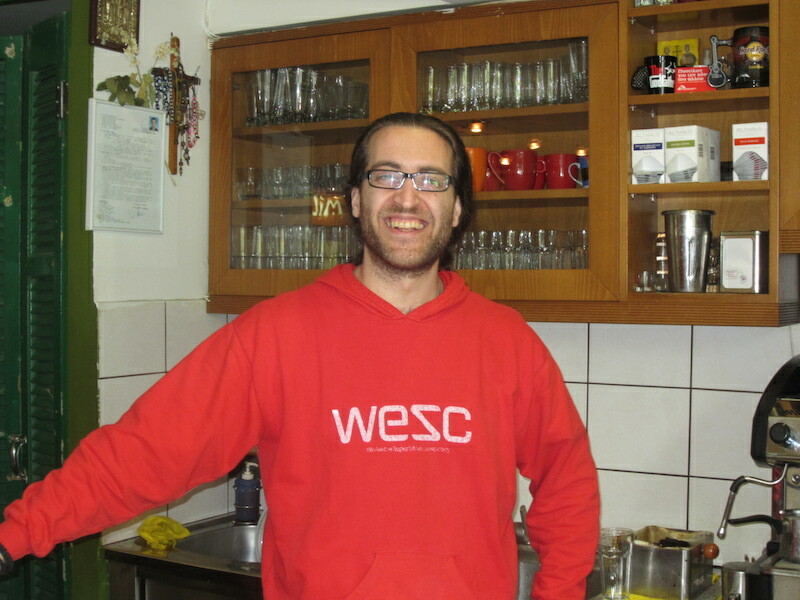 Below is a photograph of Kostas, part owner of a café in Thessaloniki we often frequented. To us, Kostas is the face of Greece. The Greeks will keep smiling and laughing: it’s in their nature. Thanks to all our friends and acquaintances, who made our visit to Greece so memorable. I’m sure one day we will be back. The next posting will relate to getting set up with bicycles and camping gear for a biking mission in Switzerland. At the time of writing this post we had completed the mission so I can justly say it was fantastic although we were plagued with hot head winds straight off the African deserts. Don’t forget leave a comment we love hearing from our followers. Safe travelling to all. But no spam please. Another wonderful read ! Been busy lately so am struggling to keep up with your postings. 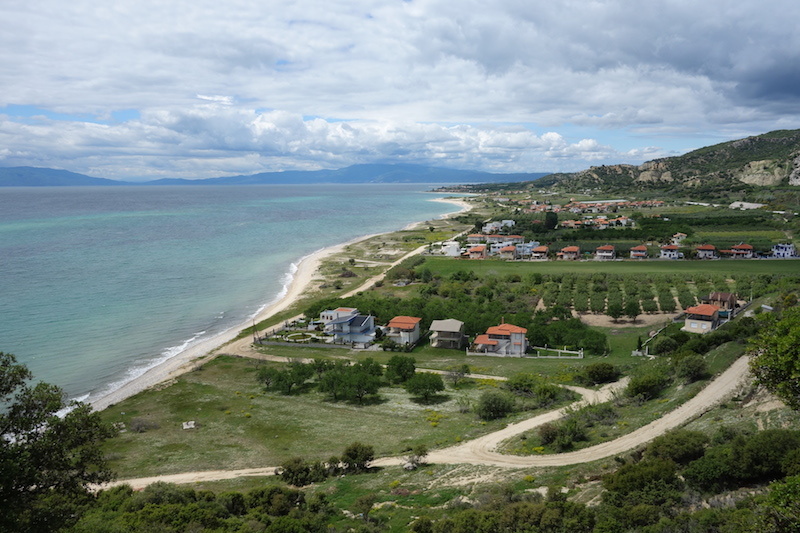 If you have only just read Greece: Central Macedonia you have a long way to go, I suggest you take a holiday on a Greek island and catch up.